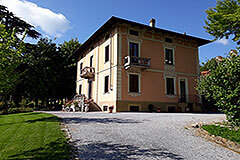 Luxury Country Home for sale in Piemonte Near Alba Langhe Hills (ref: 8061)- Luxury Liberty property in the Langhe close to Alba with its own Dolcetto d'Alba vineyard. Piedmont Properties in Piemonte. Property for sale Langhe and Piemonte.